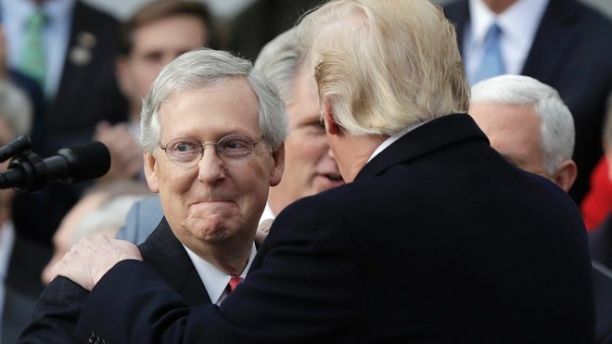 When congressional Republicans joined President Trump for a tax bill celebration at the White House just before Christmas, a triumphant Mitch McConnell began ticking off the president’s first-year accomplishments. The boasts from the Kentucky Republican, who’s had a rocky relationship with Trump at times, underscored how – despite the internal squabbles that captivated the media – the Trump administration has given his party plenty to crow about in 2017. 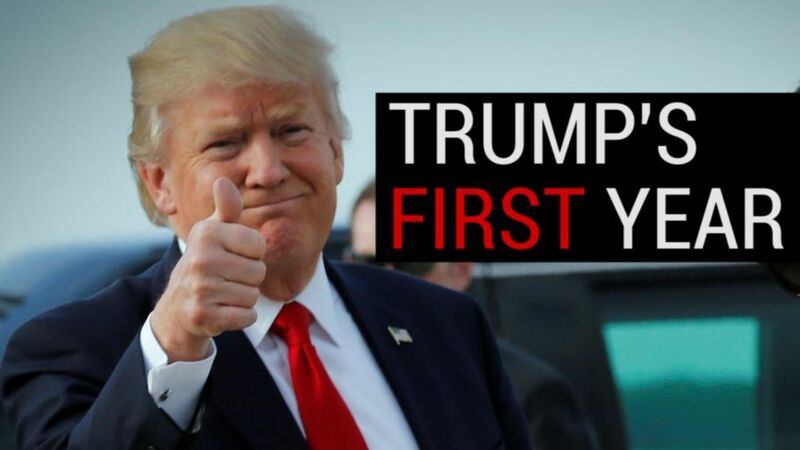 To be sure, there have been plenty of campaign promises that Trump did not fulfill in his first year: a wall has not yet been built on the border with Mexico, ObamaCare hasn’t been repealed (though the individual mandate has) and an infrastructure package hasn’t yet passed in Congress. Meanwhile, Trump’s White House has been hampered at times by Special Counsel Robert Mueller’s Russia investigation and daily drama, often the result of tweets fired off by the president himself. “This has been a year of extraordinary accomplishment for the Trump administration,” Senate Majority Leader Mitch McConnell said. But Republicans inside and outside of the White House contend that the media, which hammer Trump on every misstep, aren’t giving him due credit for the 2017 gains his administration has made in a combative political environment. A senior administration official said that while tax reform has been widely described as Trump’s first major legislative win, they have counted 81 pieces of Trump-backed legislation that are now law. “That’s in addition to 15 congressional review acts whereby the president took a look at laws that were passed without the benefit of congressional review, and decided to reverse or undo them,” the official said. President Trump signed the tax bill in the Oval Office just before leaving Washington for the holidays. The tax bill cuts the corporate tax rate from 35 percent to 21 percent and reduces the rates for most of the seven individual tax brackets. 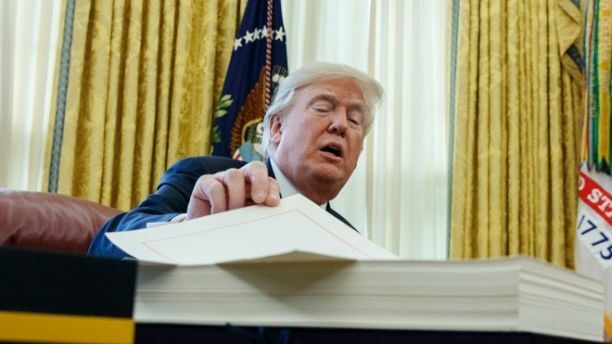 While critics panned the law as a big tax break for the wealthy and corporations, the overhaul doubles the standard deduction, which the Trump administration argues is a boon for the middle class. The legislation also allows Trump to say he’s working to dismantle ObamaCare: the bill includes a repeal of the Affordable Care Act’s individual mandate requiring Americans to buy health insurance or face a penalty. 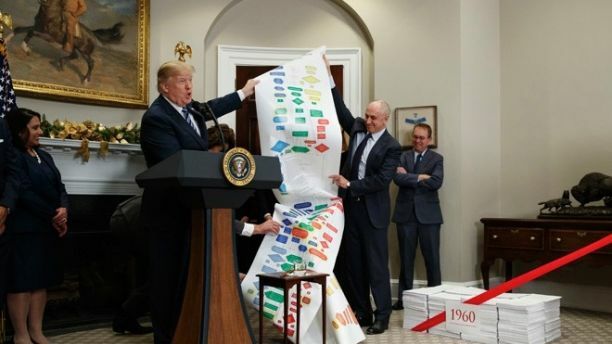 President Trump holds up a chart on highway regulations during an event on federal regulations in the Roosevelt Room of the White House, Thursday, Dec. 14, 2017, in Washington. Gridlock in Congress has not stopped the president from unraveling former President Barack Obama’s executive action legacy, especially through regulatory rollbacks. “You’ve ended the overregulation of the American economy,” McConnell told him during the White House celebration. 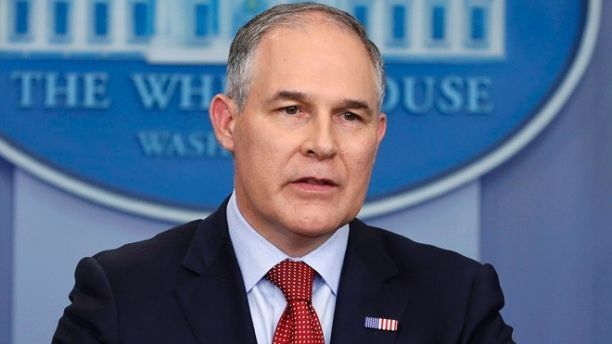 Trump’s EPA has moved to roll back the Clean Power Plan and he has used the Congressional Review Act, an obscure rule-killing law, to wipe out a wave of last-minute regulations pushed through before he took office. After taking office, the president signed an executive order mandating that two regulations must be eliminated for every one created. The White House says the administration has surpassed that ratio, claiming to have eliminated 22 regulations for every new regulation. Trump has taken other actions to please conservatives, including moving to withdraw from the Paris climate agreement, green-lighting the Dakota Access and Keystone XL oil pipelines and withdrawing from the Trans-Pacific Partnership. Trump often cites his successful nomination of Supreme Court Justice Gorsuch when discussing his accomplishments as president. Trump often cites his successful nomination of Supreme Court Justice Gorsuch when discussing his accomplishments as president. 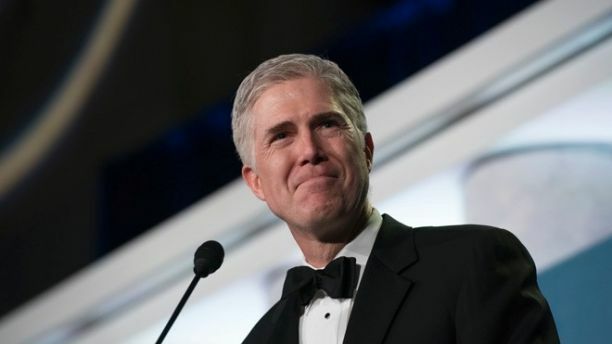 Gorsuch had been on the list of potential nominees that Trump released during the campaign, after the death of Justice Antonin Scalia. But Republicans are also thrilled about his nominations to lower courts. The Trump administration has been intentionally choosing young conservative judicial nominees who could stay on the bench for many years to come. As of mid-December, 19 of Trump’s 66 total nominees this year have been confirmed by the Senate. In this Nov. 9, 2017 photo, aerial view of the damaged hospital complex and surrounding areas in Mosul, Iraq. 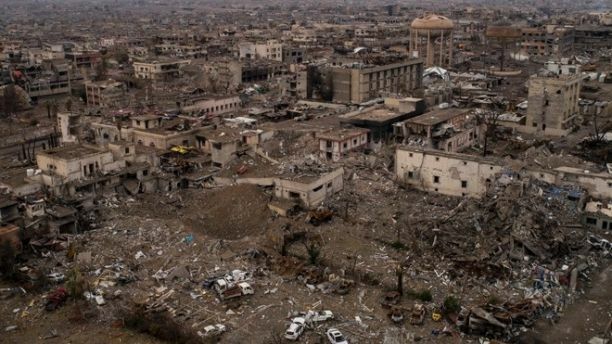 The complex, located in Mosul’s al-Shifaa neighborhood, was the main medical center for the Islamic State group during its rule and was heavily damaged during fighting when Iraqi forces wrested Mosul back from the militants. As the Islamic State orchestrated terror attacks and established a caliphate in Iraq and Syria during the 2016 presidential campaign, Trump famously promised during to “bomb the sh-t” out of ISIS. The gains cannot be ignored. U.S. military officials said this week that ISIS has lost 98 percent of the territory it once held — with half of the terror group’s “caliphate” having been recaptured since Trump took office. The latest American intelligence assessment says fewer than 1,000 ISIS fighters now remain in Iraq and Syria, down from a peak of nearly 45,000 just two years ago. Earlier this month, Iraq’s leaders declared victory over ISIS. The Dow Jones Industrial Average has hit record highs more than 60 times during Trump’s presidency. Trump is never shy about taking credit when the stock market is doing well, and closed the year by predicting the tax bill will spur another year of growth in 2018. 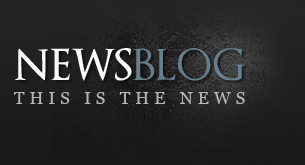 “Will be a great year for Companies and JOBS! Stock Market is poised for another year of SUCCESS!” he tweeted Tuesday. 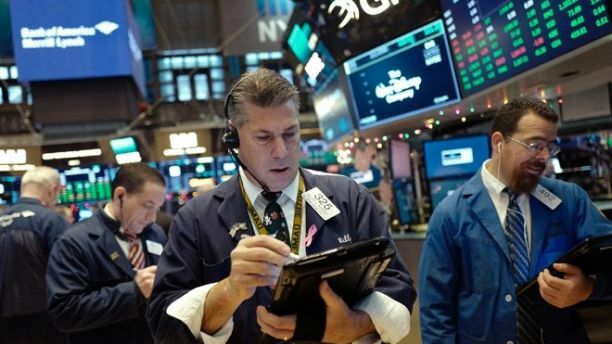 The Trump administration has indeed been good for Wall Street: the Dow Jones Industrial Average has hit record highs more than 60 times during Trump’s presidency. The White House cites statistics saying more than $5 trillion in wealth has been added to the U.S. economy since Trump’s election. Other indicators show the economy has improved under Trump. The country’s 4.1 percent unemployment rate is the lowest since December 2000. And the economy grew 3.2 percent from July through September, the highest quarterly economic growth in three years. Trump has pleased his base by appointing conservatives like EPA administrator Scott Pruitt. Trump has pleased his base by appointing people like Attorney General Jeff Sessions, EPA Administrator Scott Pruitt, Education Secretary Betsy Devos and Energy Secretary Rick Perry to high-profile government positions. In a less than a year, these officials have enacted conservative policy at departments and agencies after eight years of liberal governance under the Obama administration. The president also officially recognized Jerusalem as Israel’s capital earlier this month, following through on a promise to put in place a plan to move the United States embassy to the holy city. He pardoned ex-Maricopa County Sheriff Joe Arpaio in June, a move that was welcomed by supporters of a tough stance on illegal immigration.